This month of April we have 2 events for you kids with Ana Craciun Lambru ! 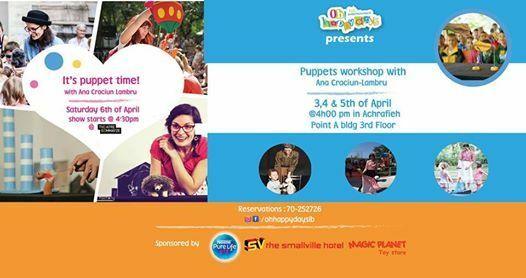 3-4 & 5th of April from 4:00 till 5:00pm: Puppets WORKSHOP: learn how to create your own puppet and manipulate it! String puppets, Hand puppets and Ombres chinoises!!! Don’t miss this UNIQUE chance to have fun while learning cool things !!! 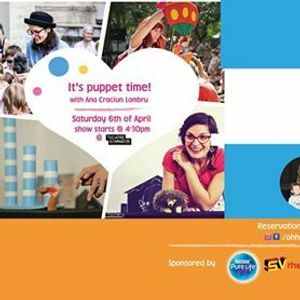 6th of April @ 4:30pm: Puppets SHOW : It’s puppet time! @ Théâtre Gemmayze. A show created for the joy of kids of all ages . We do believe that puppets can change the way our kids think !